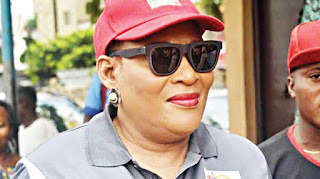 Women Leader of the All Progressives Congress (APC), Chief (Mrs.) Kemi Nelson has denied receiving N75 Million from Senator Oluremi Tinubu to organise a rally against Senator Dino Melaye for reportedly assaulting Tinubu at the senate chamber recently. Reacting to a report by a civil rights movement, Committee for the Defence of Women’s Rights that Senator Oluremi Tinubu released N75 million to her through one of her sisters simply identified as Funlola, to organise a protest against Melaye, Nelson said that the report was a figment of the imagination of the committee. The National President of CDWR, Prof. Taibat Majekodunmi, had made the allegation against Nelson in a statement issued on Monday in Abuja. “Already, the protesters have stormed Abuja and have booked for 300 rooms in many Hotels in hotels in Abuja,” the statement said. Nelson said in a statement she personally signed and which was made available to the press that she didn’t need to collect money from Senator Remi Tinubu or her husband, Asiwaju Bola Ahmed Tinubu to organise such a rally, adding that they were her mentors, who she was ready to support without any pecuniary gain. She said further that she would actually participate fully in a rally that would be staged by a women group on Wednesday July 20 in Abuja to protest the alleged assault on Senator Tinubu by Senator Dino Melaye during a closed door meeting of the senate last week. “We are moving to Abuja in full force to be part of this protest against Melaye for harassing a woman of substance like Senator Tinubu, whose family paid a huge price for our democracy. Our democracy is still nascent and we must do everything within our power to protect it. “We should not allow people like Melaye to rubbish what took years and cost us several lives to achieve. What Melaye did was not just against Senator Tinubu, but against all women and against our democracy. We will not behave like Nero, who sleeps, while Rome burns. “All right thinking members of the society must rise against this oppression and an open insult against women by a man that has done little or nothing for our democracy. We cannot pretend that nothing is happening, when such a sacrilege is being committed in our country,” the statement read. Nelson stressed in the terse statement that she would be leading several women from Lagos to Abuja to protest against a system that she said allows someone like Melaye to debase a woman that, according to her, should be celebrated by the people. She emphasised that this is the best time to ‘put people like Melaye, where they belong,’ adding that posterity would judge Melaye for trying to trivialise the hallowed chamber of the senate. “With what Melaye has done, he has been demystified and he should be recalled by his people without any delay. We cannot keep quiet at this material time. As Professor Wole Soyinka would say; ‘the man dies, who keeps silent in the face of tyranny,” she said.